Hi everyone. It has been a very interesting 48 hours in terms of the next storm. 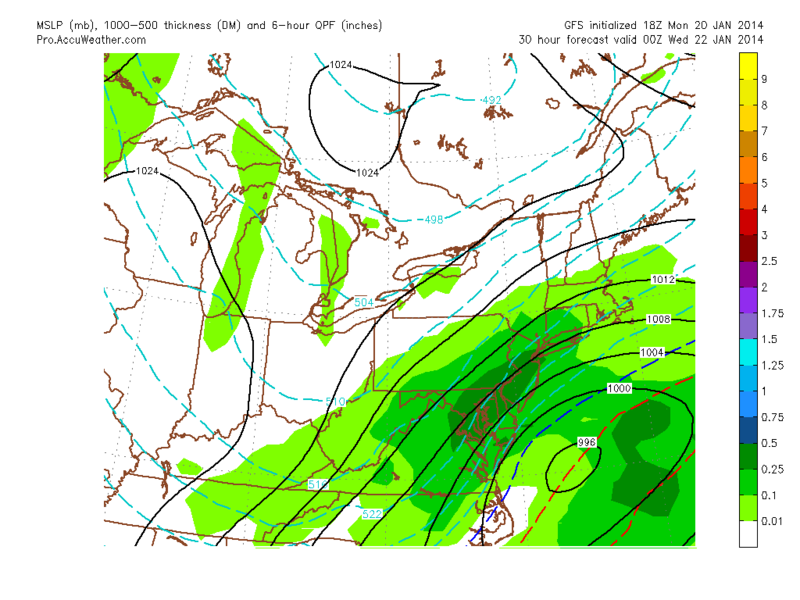 It was just yesterday when we were looking at a very small clipper system barely affecting the region. Over the past day or two, things have taken a 180 and we are now looking at a major to significant snowstorm affecting most of the northeast. The forecast models have been showing an Alberta clipper phasing with a piece of energy over the Carolinas later tonight. The resulting storm will amplify off the coast and quickly move northeast. Temperatures will be around 20 degrees, which means snow ratios will be high and salt on the roads will be basically ineffective. The map below shows the GFS model showing the storm strengthening over the Atlantic with heavy snows over the mid-atlantic. This shows the peak of the snow, which will occur from 3-9 PM. Overall, the snow will start around 11 AM tomorrow and end late tomorrow night. The snow will be heavy for an extended period of time, which means that accumulations could be large in many locations. I wouldn’t be surprised to see some reports of 10+ inches in a few isolated areas. 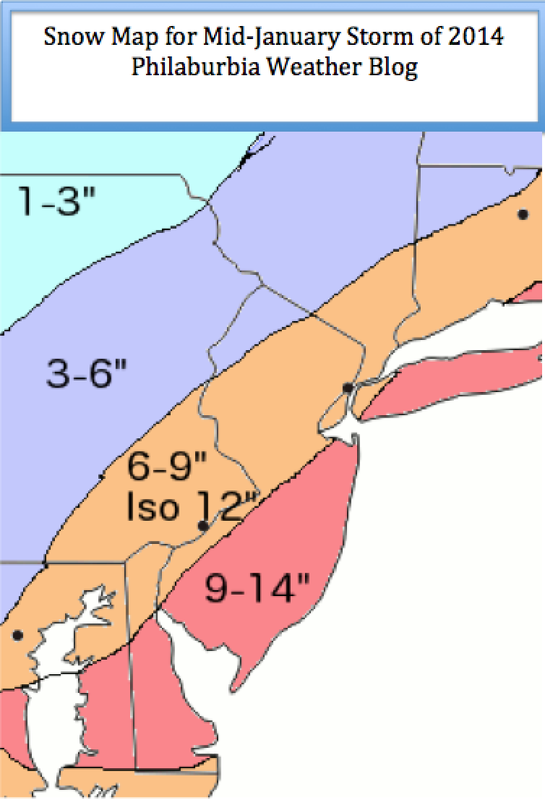 Most of the Delaware Valley will receive 6-9 inches with higher totals in the southern and eastern parts of the region. Travel will be horrible tomorrow for most of the day. Stay home. After the storm pulls through, brutally cold arctic air will arrive. Temperatures will likely not get out of the 20s for the rest of the week, unfortunately. All in all, do not expect our snowpack to melt anytime soon. Hi everyone. Todays post will be on the shorter side as I am currently blogging from the Caribbean and my Internet connection is very poor. A storm system will intensify from the southeast and ride up the coast, which will drop a general 4-8 inches of light, puffy snow in the Delaware Valley. 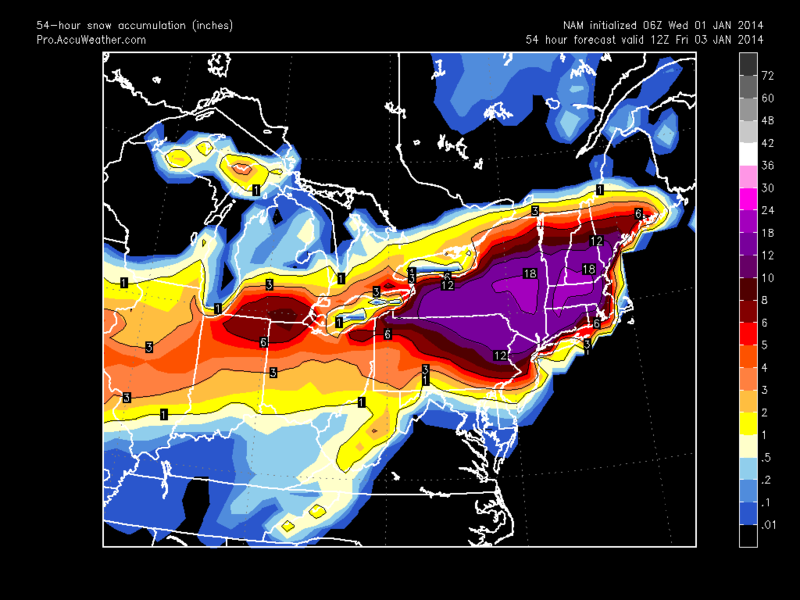 Higher totals in excess of a foot will occur in New York and New England. This storm will be a fast mover, as there isn’t much blocking ahead of the storm. The snow will likely start later Thursday night and end by Friday afternoon. Because the temperatures will be in the teens during the storm, snow ratios will be high and the snow will accumulate very rapidly. Travel on Friday will be poor and winds will be fairly high during the storm. There will likely be massive airport delays in Friday morning during the height of the storm. Many schools will likely be closed as well. After the snow, another system will affect the region on Sunday/Monday. This storm looks to be primarily rain at this point.